Calculus And Its Applications 11 Edition NOTE: You are purchasing a standalone product; MyMathLab does not come packaged with this content. If you wouldlike to purchase both the physical text and MyMathLab, search for: 013379556X / 9780133795561 Calculus And Its Applications Plus MyMathLab with Pearson eText -- Access Card Package Package consists of: 0321431308 / 9780321431301 MyMathLab -- Glue-in Access Card 0321654064 / 9780321654069 MyMathLab Inside Star Sticker 0321979397 / 9780321979391 Calculus And Its Applications MyMathLab should only be purchased when required by an instructor. 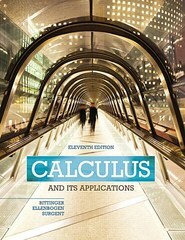 Calculus and Its Applications, Eleventh Edition, remains a best-selling text because of its accessible presentation that anticipates student needs. The writing style is ideal for today’s students, providing intuitive explanations that work with the carefully crafted artwork to help them visualize new calculus concepts. Additionally, the text’s numerous and up-to-date applications from business, economics, life sciences, and social sciences help motivate students. Algebra diagnostic and review material is available for those who need to strengthen basic skills. Every aspect of this revision is designed to motivate and help students to more readily understand and apply the mathematics.